Memo to PBS: Kleenex should sponsor Downton Abbey. I went through an entire box watching this episode. Before I begin this week's recap, a word on an obnoxious practice that is becoming far too pervasive among television reporters. For heaven's sake, why are outlets giving the entire episode away in their 'preview' pages? Why spoil it for the faithful who want to watch the story unfold on its own? The motives behind this are either stupid or mean, but either way, it's completely unacceptible. On Sunday morning, I happened on a paragraph that summarized the entire episode I'd waited seven days to see while perusing the TV pages of a paper that should know better. I was two sentences in before I realized it. The words 'spoiler alert' would have been nice. So, if you've seen the episode, read on, if not, spoiler alert! Your choice. You're welcome. It's the middle of 1918. Ever the dutiful servant even as a solider, William is readying Matthew, for battle. "Am I ready?" asks Captain Crawley. "Only you can answer that, sir," replies William before the two men join the regiment on the battlefield at Amiens. Matthew, having offered some words of encouragement and has them returned by his men, sounds the charge that sends his men over the barrier straight into the German's line of fire. The scene is positively cinematic and heartbreaking. One of the great accomplishments of this series has been its rendering of the absolutely terrifying conditions under which soliders have served during war. Even more impressive, Julian Fellowes has done it without the shock of over the top gore and violence. The short battle scenes have tremendous impact for the simple reason that they focus on the human scale showing soliders as men who, just a short time ago resided in a world so far removed from the reality they now face but who have no choice but to literally run headlong into danger expecting the worst but hoping somehow to be spared. In this episode Julian Fellowes ventures into pretty soapy territory from the opening scenes, but it worked for me. At the moment Matthew and William are wounded in battle (the former footman throws himself in front of his commander in an effort to save him and both land unconscious in a ditch), Daisy freezes over a pot in the kitchen telling Mrs. Patmore, "Someone walked on me grave" while upstairs Mary drops her teacup telling her mother and grandmother, "I'm so sorry, I suddenly felt terribly cold." As someone who comes from a long line of Irish women who have what we call in our family 'Irish intuition' I've long heard stories of relatives who woke in the middle of the night only to find out a loved one across the continent had died at that precise moment so this bit of melodrama worked for me. O'Brien wakes Lord and Lady Grantham in the middle of the night telling them to come downstairs where they are met by Mr. Mosley who has brought a telegram to Downton from the Crawley residence with word that Matthew has been gravely injured. Mary, looking appropriately ghostly reels at the news while just outside the parlor door the servants are gathered to hear the news. Lord Grantham tells them about Matthew and Daisy asks about William. Bates suggests if he's been injured his father must have received news as well. Edith (who has become one of my favorite characters since developing her newfound graciousness and compassion) volunteers to drive into the village in the morning to find out what's happened with him. The next day, Anna tells Bates that Edith has returned with the news that William is severely injured as well. Thrown by the news, she asks Bates to go into the village with her so that they can pray for both men. I'm not sure, but based on their conversation I'm wondering if they went off and got married. Bates: "We should have had a church wedding." I think they got married at a justice of the peace. Anna replies: "I'd rather have the right man than the right wedding." The news that William is at a hospital in Leeds prompts the Dowager Countess to go to Major Clarkson to request that her favorite servant be moved to Downton where he can be looked after properly and be close to his father. Edith volunteers to be his caretaker, but the major pulls ranks saying that he can't make an exception for the solider and bring him to a hospital for officers only. Granny is not happy. "When you give these little people power it goes to their heads like strong drink," she sputters after their unsuccessful meeting. O'Brien, who is growing more evil with every episode despite her random moments of remorse for her hateful actions, tells Thomas she's sorry that she's written to Vera telling her that Bates has returned to the hosue "with everything going on." Thomas helpfully reminds her "It wasn't my idea." When these two turn on each other things are really going to get ugly. Lord Grantham walks in on Mary as she prepares to go to the hospital so she can be there when Matthew is brought in. He tells her that Cora has written to Lavinia about what's happened. 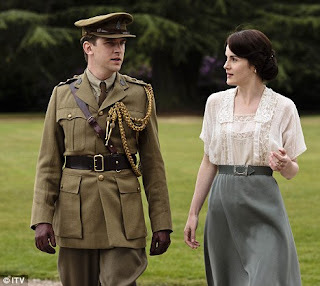 Mary quickly acknowledges that was precisely the thing to do and suggests that Matthew's fiancee stay at Downton while she's visiting so she won't be alone at the Crawley estate. Lord Grantham's face registers the full gamut of emotions for his daughter: sadness that she still loves a man she can't be with and pride over her selflessness to do the right thing despite the pain it's causing her. Just as Mrs. Patmore is encouraging Daisy to let William believe she loves him while the kitchen maid admits she's "ashamed" that "she's led him up the garden path," Vera shows up. "What do you want?" asks Mrs. Patmore who smells trouble. Nothing good, of course. Vera spews venom (her voice scares me) at Bates and Anna telling her ex (?) husband "Did you think I'd let you take up with your floozy?" and tells him that despite his payoff to her she still plans on selling her story about Lady Mary and the late Mr. Pamuk as well as implicating Anna in the cover up. "You're just angry because I'm happy," says Bates stating the obvious. "But you won't be happy for long," says Vera. Sybil and Branson engage in their usual verbal foreplay when she goes to him in the garage asking the chaffeur to drive her to the hospital to be with Mary who is attending to Matthew. "Is she still in love with him?" asks Branson. "I don't want to talk about it," replies Sybil. Branson, always spoiling for fight baits her by asking her if she won't talk about it with him because he's just a chaffeur to which she replies, "Because she's my sister." Branson's astute comeback: "You people are good at hiding your feelings." Perhaps, says Sybil, but don't think we don't have any. As much as I love Bates and Anna, this couple has got a real heat that undoubtedly will give the romantic payoff we're waiting for. Not to be denied, the Dowager Countess finds a way to bring the dying William back to Downton to live out his final days. While the doctor at the army hospital tells her nothing more can be done for him since he sustained a fatal injury to his lungs, out of earshot William's father tells the countess (and himself) that the care he will receive in familar surroundings will restore his health. Violet won't break the man's heart by telling him the truth, "Sometimes we must let the blow fall by degrees" she tells the doctor before departing for Downton. It turns our Granny really is just an old softie after all. As Mary readies herself for Matthew's arrival, Major Clarkson tries to discourage her from helping out on the ward asking her to "hang back." Undeterred, Mary tells him, "I'm not good at hanging back ... I'm staying." The sight of a deathly pale and bloodied Matthew (is it me or did half the cast look like they were auditioning for Twilight during this episode?) clearly stuns Mary and Sybil, who has matured by leaps and bounds thanks to her role as an army nurse, steps in and tenderly asks the wounded man, "Cousin Matthew, can you hear me?" A soldier who has brought in him tells the women he has been "pumped with morphine and has been unconscious since being found. Mary discovers a tag attached to Matthew's clothes which reads: 'probable spinal damage' while Sybil finds the little stuffed dog Mary had given him tucked inside the pile of clothes sitting atop his blanket. When Mary tells Sybil she'd given it to him for luck Sybil says, "If only it had worked." Stung by her words Mary tells her sister, "He's alive, isn't he?" O'Brien is getting more worked up over Vera now that she's threatening to bring the house down on "my lady" since the vengeful maid had only planned to make trouble for Bates in bringing her to Downton. Thomas tells her it's her mistake because she didn't think it through ("It's all in the details," he scolds her). O'Brien calls him a "know it all." But Thomas has the last word: "Don't take it out on me -- you're the one who did it." Anna tells Mary that Vera has returned with her threats to go public with the story of Pamuk's death in her bed and Mary decides she has no choice but to go to Sir Richard, come clean about the story and ask for his help in keeping her quiet. "Suppose he throws you over?" asks Anna. (I think Mary was secretly hoping for this to happen). Mary tells her maid-slash-BFF that she has no choice and will go to London right away to ask her slimy (my word, not hers) fiance for help. But what about staying here and looking after Matthew, asks Anna? "I can take some time off to save my own neck," Mary tells her. William has taken a turn for the worse and his father is afraid to leave him. Edith tells the heartbroken man that she will stay with his son. "He won't be alone. Not for a moment." I'm really starting to love her. Lavina arrives and finds Mary and Lord Grantham at Matthew's bedside. She is told his spinal cord is permanently damaged. "Will he walk again?" she asks. "No," says Major Clarkson, "He won't." While Lavina cries, the doctor tries to reassure him by saying, "It's not the end of his life" with Mary adding, "Just the start of a different life." In the hallway away from the women, Lord Grantham takes on the harsher aspects of what Matthew is facing asking Clarkson if Matthew can ever father children and is told no, not ever. Will there really be no love scenes in Mary and Matthew's future? This is really distressing news. In what I found to be an unnecessary detour in the episode. Mrs. Hughes visits Ethel who has had her baby and, despite her best efforts, has not been able to get Major Mustache to write to her or to see the child. While Mrs. Hughes is sneaking food out of the house for the unwed mother and her infant son, she wholeheartedly disapproves of Ethel's behavior and tells her as much. So why is she helping her. Later, when the major visits Downton to see some of his old friends, Mrs. Hughes tries to convince the cad to have some contact with Ethel and "the wee lad" but is told in no uncertain terms to mind her own business. I don't care one iota about this storyline and it took valuable time away from everything else. I hope this doesn't gain any traction in the last three (!) episodes left. Mrs. Patmore is still trying to convince Daisy to go to William, tell him she loves him giving him what little happiness she can before he dies. The poor girl is terrified and doesn't know what to say to her faux fiance. "You don't have to be Shakespeare," says the kindhearted cook. Reluctantly, Daisy goes to his room on an upper floor in the house where he has been squestered from the officers while Edith cares for him. William asks Daisy to marry him. She skitters back to the kitchen without giving him an answer. Downstairs, Mrs. Hughes interviews a new maid, a war widow with a baby. The head housekeeper tells the young woman she will discuss hiring her with Mr. Carson. "I have to earn," says the pretty young woman. Dreaming of Mary, Matthew wakes to her voice and asks her to tell him about his condition. "Why don't we wait for Lavinia," she tells him. But before long Mary tells Matthew his spinal cord has been damaged and when he asks how long will his injury last, her non-answer tells him all he needs to know. "I'd much rather know," he says while apologizing for "blubbering." Poor Dan Stevens looked positively vampiric in these scenes. It's a credit to his acting that it was only a slight (but unfortunate) distraction. With her heart breaking, Mary tries to cheer him, "Blubber all you like then when Lavina is here you can make plans." When she gets up from his bed, her tears flow as well. A word here about the great performances of Dan Stevens (Matthew) and Michelle Dockery (Mary). Both actors did their finest work of the series in this episode. Stevens' Matthew coming to terms with the end of the life he envisioned was heartbreaking and Dockery, who merely has to raise her brow slightly to register the appropriate emotion played devastated but determined Mary to perfection and had me rooting for this increasingly sympathetic heroine more than ever. Bravo to both of them. The scene between Mary and Sir Richard when she goes to him to tell him the story of that fateful night with Pamuk was riveting. The positively reptilian Richard (is it me or does his voice make him sound like he could be related to Vera?) says upon hearing the tawdry tale: "Who'd have thought the cold and careful Lady Mary Crawley ... Do you still expect me to marry you?" I don't know about you, but he made my skin crawl. Mary tells him they could dissolve their engagement since it hasn't even been announced but creepy Sir Richard has other plans. Before he tells Mary what he'll do, he reminds her that if they were to marry everyone would assume it is he who is marrying up into nobility, but they both know the real truth now. He'll set a trap for Vera to keep her quiet for his own unchivalrous reasons: "We come to marry on slightly more equal terms and that pleases me." What a guy. Meanwhile, Lavina tries to convince Matthew that she doesn't care if he won't walk again. Matthew, who says he loves her for saying so, tells her there's "something else" that he can barely bring himself to tell her. "We can never be properly married." It takes a minute for this to sink in with Lavina but she recovers telling him, "That side of things is not important to me." Matthew, clearly anguished at having to break the young woman's heart tells her: "I couldn't possibly be responsible for stealing away the life you ought to have. Go home. Think of me as dead. Remember me as I was." I pause the DVR to get a second box of tissues. Branson and Sybil meet again in the garage and this time almost kiss. He tells her the rebels have killed the czar and his family. "I never thought they'd do it," he says. He starts to talk politics but Sybil reminds him they promised to put their politics aside until after the war. "Sometimes a hard sacrifice must be made for a future worth having." He touches her waist as she goes to leave, they almost kiss but she pulls away at the last moment. My money is on the next episode for the long awaited liplock. I was happy for that brief passionate interlude because I cried my eyes out through rest of the episode. William tells Daisy he knows he's dying and he wants to marry her so he can leave her a widow's pension. "You'll be looked after. It's something to fall back on," he tells her as his breathing gets more shallow. "Let me do that for you." I knew from the moment this character enlisted he wouldn't make it through the season but Fellowes' depiction of his death has been more poignant than I could have imagined. I will really miss this sweet, earnest character. Remember how proud he was to serve that last dinner at Downton in his uniform? It's just so unbearably sad. More tears as Mary finds Lavina weeping in her bed. She is stunned to learn that Matthew has told Lavina they "can't be lovers" and he won't marry her. "I'll die if I can't have him," Lavina sobs to Mary. That makes two of you. At the breakfast table the following morning Lord Grantham is livid to read an announcement of Mary and Sir Richard's engagement. "Is that why you went to London yesterday?" he bellows at his equally surprised daughter. Now Mary knows her deal with the devil is etched in stone. "Didn't he ask your permission?" he asks incredulous at the "high handed" behavior of his soon to be son-in-law. "I don't think asking permission is his strong suit." The vicar has come to Downton to express his concern at marrying William on his deathbed to a maid who, he suspects, might be in it for her widow's pension. The Dowager Countess has had enough of men that are beneath her standing in the way of doing what she knows is right. After reminding the vicar that his house, church and its very flowers all come to him courtesy of Lord Grantham she fires her best shot of the episode: "I hope it's not vulgar of me to say I hope you find some way to overcome your scrupples." Speaking of scrupples or lack thereof, Vera bursts into Sir Richard's office furious at being tricked into signing a contract with him which legally binds her to remain silent about Mary and Pamuk or suffer the consequences. "If I so much as read her name ... I will hound you and ruin you and have you locked up." Vera vows to get revenge on Bates which Sir Richard tells her he couldn't care less about. Back at Downton, Lord Grantham, who seems to have a lot of freetime this episode is in the library when the new widowed maid bursts in. I detected some distressing chemistry between Lord Grantham and 'Jane' before Mrs. Hughes found the young woman and sent her off to clean the drawing room. I so want to be wrong about this, but I suspect that because Cora has become the busier of the two Grantham with her newfound sense of purpose running the convalescent hospital, the man of the house is feeling a bit neglected (note that she was sending her husband off on a social engagement alone in an earlier scene because she was too busy). I will be so not happy if he helps himself to the help but I get the feeling something is going to happen. Daisy sits in the kitchen with freshly bobbed hair. Carson gives her a small bouquet from the gardens, offers her his arm and she leads the servants upstairs to William's room which has been poignantly decorated with the same flowers for his bedside nuputials. Fellowes somehow avoid veering into All My Children territory here because the scene is so still. It feels so real. With the servants, Edith and a tearful Dowager Countess ("I have a cold") looking on, the couple exchange vows along with their first -- and last -- kiss. There isn't a lot of dialogue. There doesn't have to be. Mary is downstairs tending to Matthew who tearfully tells her, "No sane woman would want to be with me" and wretches into a bucket sickened by what he has become. He bitterly remembers how different things were just a few short years ago, when he broke off their engagement and strode out of that fateful graden party. Now, he's become "an impotent cripple stinking of sick." As she gets up to leave, Mary sees that Isobel has returned. Clearly moved to see how lovingly Mary is caring for her son, Isobel tries to put on a brave face as she approaches his bed. Matthew dissolves at the sight of his mother. I've only one tissue left. Upstairs, Daisy sits at the foot of her new husband's bed. Mrs. Patmore comes in offering to take her place while the new bride gets some rest. "I won't leave him now that he needs me," she says. "He doesn't need none of us no more," says William's father from the head of bed. And just like that, the last bit of innocence that remained at Downton Abbey is gone forever. Poor William. I guess we all knew he was doomed from the time he became so adamant about wanting to go to war. I don't think Daisy bobbed her hair, I think Anna just curled the sides with Lady Mary's curling iron. Curled sides, bun in the back - typical style for the period - think Elizabeth Bowes Lyon. At the very end Daisy was able to kiss William him warmth and without hesitation - and of course sit with him until the end. I hope she can get over feeling guilty, and become proud of being the wife of a war hero. No doubt Thomas will find something about it to rag her with though. I did not pick up on any 'chemistry' between Lord Grantham and the new maid, and hope they don't take the story in that direction. Lord G's kindness and compassion have allowed me to enjoy his character - albeit a fictitious one. My jaded view of the real British aristocracy is they are an amoral, useless lot. If Lord G is feeling at loose ends while his wife becomes more busy, it's his own fault. He could pitch in, interact with the officers, encourage them, make relationships. Instead he has been doing an awful lot of sitting behind the newspaper. I love the development in Edith's character as well - although I'm glad the farmer's wife nipped that budding affair! I would like to see a scene in which she and Mary call a truce, and allow each other to find love, without interference from the other. Is it too much to think they could even become friends? They did mention Evelyn Napier coming to Downton for rehab. Perhaps Edith will have another shot at him? I think both actresses have done a wonderful job of showing the 'girls' grow up into elegant, poised women. As for Lady Sybil, Branson will be an OK match for her, but only if he makes something of himself. I don't want to see her with a wanna-be Socialist/Marxist/revolutionary. Where I live, we get two chances each week to see Masterpiece,as it runs on different channels on different days. I always watch both, to pick up any nuances I may have missed.